Homeopathy helps fevers, not by suppressing the fever itself, but by stimulating the body to overcome the problem causing the fever. Parents are usually surprised at how quickly this happens. A fever may break within minutes of giving the correct remedy, and there should certainly be a significant improvement by 2 – 3 doses. The following article points to four homeopathic remedies that help childhood fevers. There are others, but these main ones should be in every home medicine cabinet. Fevers – Hindrance or Help? Fever is the body’s natural response to infection. It stimulates the immune system to work more quickly and creates a hostile environment for invading organisms. 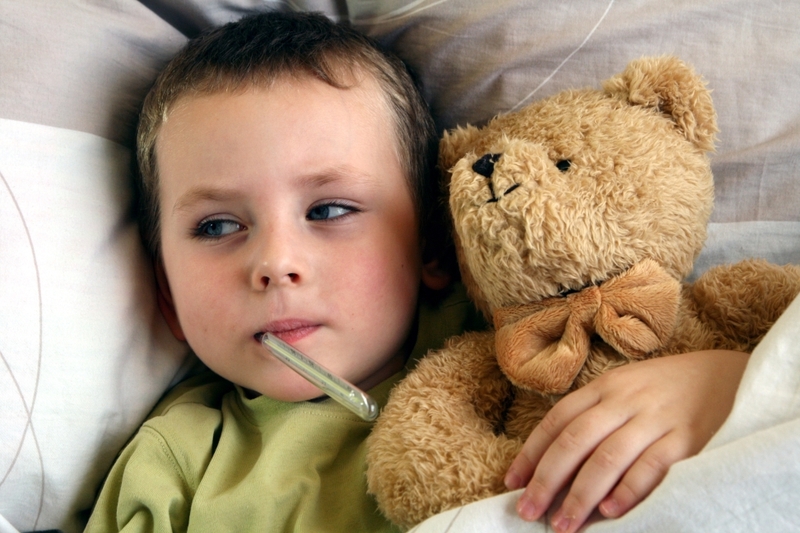 If your child’s fever is suppressed with temperature-lowering drugs, it fails to respond as quickly and the infection is likely to be prolonged (or worsened). Important metabolic processes can be disrupted and research indicates there is greater risk of developing other health problems such as asthma. Traditionally, homeopathy has been used to safely manage fevers without causing any of the above problems. It corrects the underlying imbalance, stimulates the body’s natural ability to self-heal, and significantly reduces recovery time. With a little knowledge, it’s also simple to use in the home. The following remedies are just four of those commonly used for fever. For the early stage of fever when the onset is rapid and intense, and the fever is high. The fever may have been preceded by a shock or fright, or exposure to a cold, dry wind. The child will be agitated, restless, and anxious. They are usually sweaty and thirsty for cold drinks. Pupils may be constricted. Sudden and violent fever that may lead to delirium. The child will have a bright red or flushed face – especially the cheeks (the right cheek may be more flushed on the left cheek). While the head it is usually hot, the hands and feet will be cold. Pupils will be dilated with an intense headache that is usually throbbing in nature. The headache will feel better for sitting and worse for lying, or being bumped or jarred. The child will feel more comfortable in a darkened room and may crave lemon drink, lemonade, or cold water. They may also be thirstless or especially sweaty. Complaints triggering the fever (such as middle ear infections and tonsillitis) will usually occur on the right hand side. Useful for the first stage of an acute illness when inflammation is present but it is too early for clearly defined symptoms. The fever may be high but its onset is not as rapid or as intense as is seen with a Belladonna or Aconite fever. The child’s face is usually flushed and there may be reddened patches on the cheeks. Sometimes there will be paleness of the face. The child may be restless and alert, but not anxious as with a Belladonna or Aconite fever. There may be redness of the tonsils or ear, but if pus is present, or nasal mucus is thick, Ferr-p will no longer be helpful. The child may refuse meat or milk but be thirsty for water. The Pulsatilla fever can be either high or low, but the child will be clingy and easily upset. They want cuddles and affection, climbing onto your lap and snuggling into you if you sit down. They feel worse for warmth and stuffy rooms but feel much better when gently carried in fresh air. They are also thirstless with the fever and have changeable moods. Give one pill or five drops of the remedy every two to four hours. Once you notice an improvement, space doses further apart, giving the next dose only when symptoms start to return. If there is no improvement at all by three doses, choose a different remedy. Be aware that a prolonged fever, dry mucus membranes, a temperature higher than 40.5C (105F), a mottled rash, stiff neck, or unusual weakness, drowsiness and lethargy, may mean indicate something more serious than a simple fever. If at all concerned about the severity or cause of the fever, or if your child is under 2 months of age, please consult your health care professional.